by Newman, Paul [Koautor] | Redford, Robert [Koautor] | Hill, Gregory Roy [Koautor]. Visual material | USA 1973 | Spielfilm | DVD-Video | DVD | ab 12 Jahren | Drama | Lustspiel | KomödieAvailability: Items available for loan: SB Hennef [Call number: DVD] (1). by Kane, Bob [Vorlage] | Nolan, Christopher [Regie] | Freeman, Morgan [Darst.] | Ledger, Heath [Darst.] | Bale, Christian [Darst.]. Visual material | 2008 | Spielfilm | DVD-Video | DVD | Science-Fiction/FantasyAvailability: Items available for loan: SB Hennef [Call number: 1704 DVD] (1). by Gutiérrez Alea, Tomás [Autor] | Ibarra, Mirta [Darst.] | Cruz, Vladimir [Darst.] | Perugorría, Jorge [Darst.]. 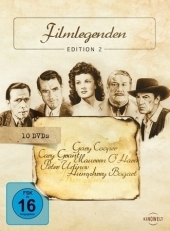 Visual material | 2004 | Spielfilm | DVD-Video | DVD | KomödieAvailability: Items available for loan: SB Hennef [Call number: 1043 DVD] (1).